You are currently browsing the category archive for the ‘IBM Mashup Center’ category. 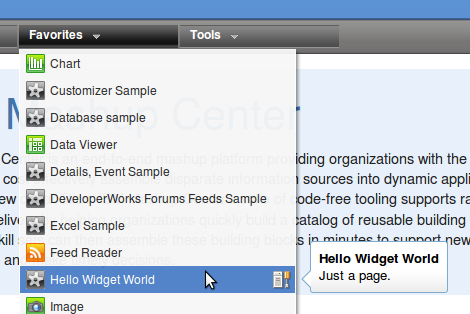 WebSphere Portlet Factory (or WPF for short) 6.1.5 can be used to develop widgets (or iWidgets as they are also known) and sent to IBM Mashup Center (or IMC for short) 2.0 for end users to use in their mashups. All on 64-bit Ubuntu 9.10 (also known as Karmic) using 32-bit Eclipse and the same 32-bit Java 6 as used by IMC’s application server. 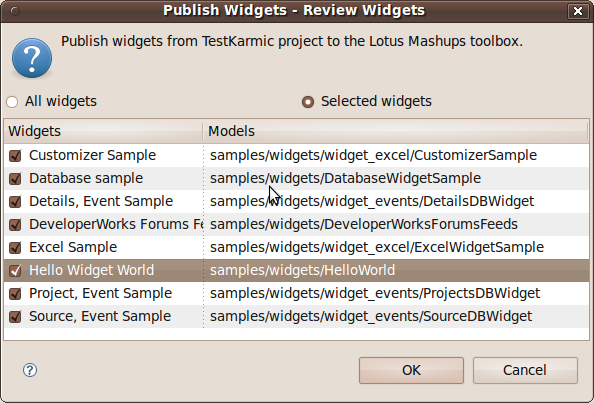 No issues – it’s a brilliant integration that works well on 64-bit (and presumably 32-bit) Ubuntu 9.10. If VMware Tools are installed, and the VMware image starts fullscreen, then GDM logon will fail with X server issues – workaround is: start VMware image in a non-fullscreen mode, once logged on, enter fullscreen mode if desired. These three are the three important aspects of the IMC. The first two have their UI using the same branding, go under the same name “IBM Mashup Center”, and they run on the Application Server. I work in IBM Software Services for WebSphere and Lotus (ISSW and ISSL respectively), who do specialist work for customers. Contact ISSW or ISSL for more details. I can also be contacted through email. Any views here are my own and don’t necessarily represent IBM’s positions, strategies or opinions.